So you've decided to build a small home library. Perhaps you already have a good collection of books, or maybe you simply want to ensure you have a stylish reading space for your specific literary material. Whatever the case may be, a home library can add a sense of sophistication to your home, while also offering an area of rest, relaxation, and enjoyment. When developing your home's reading space, there are numerous things to consider and contemplate. 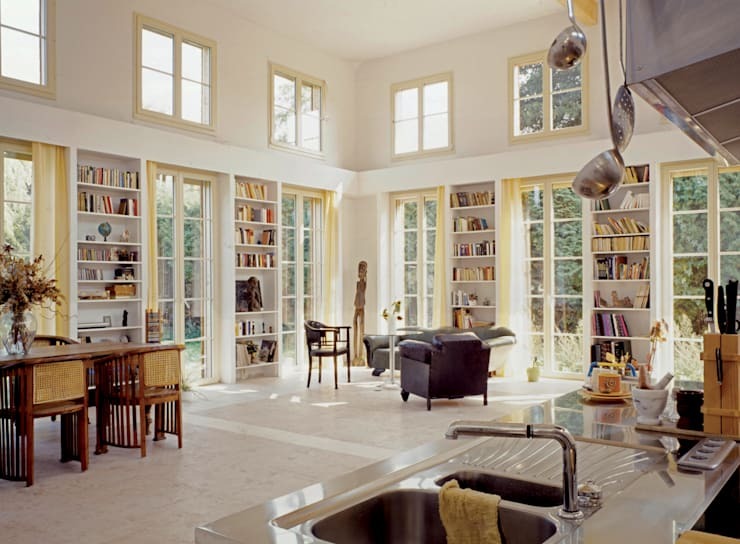 Firstly, you will want to ensure you situate the library in a comfortable and suitable position within your dwelling. Secondly, you will want to decorate, illuminate, and furnish with style. Think about the volume of windows within the room, as well as the shelving itself, and if you need a little assistance, homify is here to help! Check out our handy tips and tricks below, and create a functioning and well-designed home library for your elegant abode. First things first—depending on your needs, you will want to ensure that your library is in a comfortable and practical space; a space that is easy to use and strategically positioned within the house. The next important factor when creating the perfect home library is what type of mood and lighting are you wanting to achieve? Lighting is essential to make sure you are able to read the books easily and comfortably and depending on the style of your home you want to make sure that your home library matches its surroundings. In this example, the modern and stylish furniture creates an atmosphere that is cool, calming and contemporary. The bespoke library has been installed in the middle of the room, acting as a divider between the spaces and becomes a design feature in its own right. If you are hoping to create a family friendly area that gets used regularly, consider incorporating your reading area into your lounge. A living room can often provide abundance space for a large bookshelf, and works wonderfully to integrate individuals, with a welcoming feeling of hospitality. 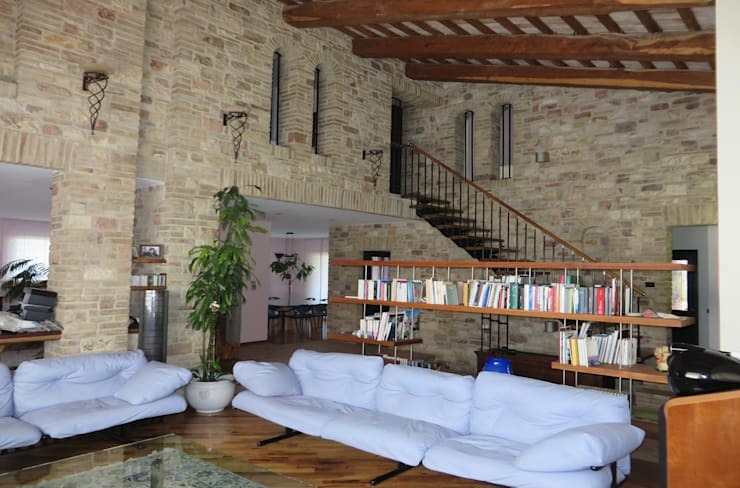 Take a look at this example, the long bookshelf is perfectly situated to allow anyone to walk past, choose a book, and seat themselves down upon the sumptuous and overstuffed blue sofas. However, if you are looking for an area of quiet contemplation, you may want to choose a room that is slightly segregated from the rest of the raucous living spaces. Consider a quiet corner of a bedroom, or if you have the space, a separate area altogether. This absolutely gorgeous example from Sigmar, is a perfect illustration of how to correctly employ built-in cupboards to create your library. Truly library-esque in its appearance, the wall of shelving features a sliding ladder that helps the occupant reach the books located on the higher shelves. If you have a large collection of reading material, consider a wall of cupboards that will allow you to store everything easily and accessibly. The best way to get the incorporated shelves that you desire is to chat to a professional, and ensure the design suits your interior, and is expertly undertaken. Other than lighting, furniture is one of the best ways to create a comfy and easy to use space. If your seating is bad or impractical, the room will feel uncomfortable, and end up disused. 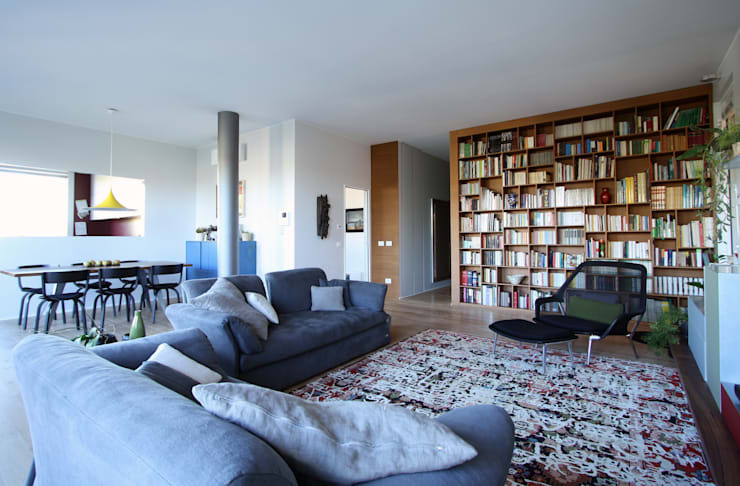 Here in this example we see a gorgeous incorporated bookshelf, which is surrounded by comfy plush sofas. Additionally, a plethora of throw cushions have been employed, adding to the overall welcoming vibe of the room. There is a single armchair for those who want to sit a little upright when reading, with a matching ottoman sofa for comfort. When choosing your furniture, and before bringing anything home, ensure you test it out in the shop to check for comfort, practicality, and overall style. Decorations can make or break a room. Too little, and your space may feel unwelcoming, however too many, and the area will exude a cramped and messy ambience. Here we see the perfect volume of ornamentation. The shelving is built into the wall, while the opposite wall is adorned with modern art, evoking a sense of interest and intrigue. 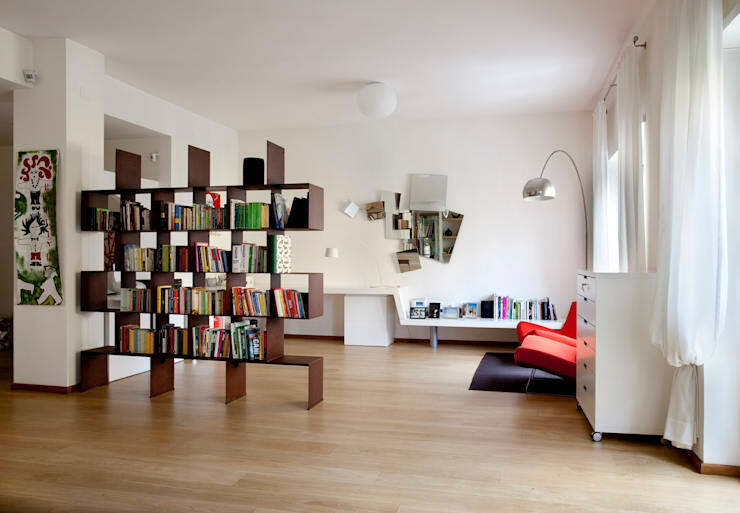 The furniture is simple, and the bookshelf features a host of other object d'art, adding a unique quality to the space. If in doubt, employ a 'less is more' approach, and add decorations slowly until the desired appearance is achieved. Finally, and certainly one of the most important elements, natural light! Natural illumination is brought into a room through windows, and these are certainly a necessity for any open and breezy space. If you are considering a room that is dark, cosy, and isolated, you may want to choose a space with less openings, while a bright and airy library will require a good amount of glazing. In this example we see a family room that employs a library theme, evocative of heritage spaces and large college halls, the room is undeniably stylish. In the corner there is a reading zone, which is well serviced by a huge amount of windows. The doors are also able to be opened up, bringing a cool breeze inside, and offering the perfect place to read during the warmer months. Often windows are not something that can easily be changed within a home, but if you are building a new house from scratch, you will want to consult with your architect about the volume of light available for your library. Do you have any other tips or tricks for our homify community? We'd love to hear from you in the comments below!